The Hirshhorn Museum in Washington, DC, decided to postpone a monumental projection across its façade by the Polish artist Krzysztof Wodiczko that included an image of a gun after a school shooting in Florida killed at least 17 people on Wednesday (14 February). 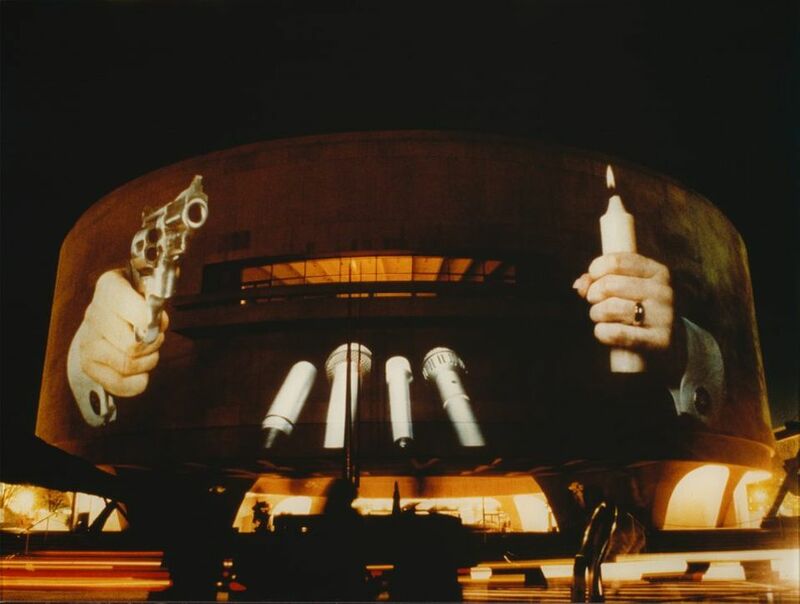 The site-specific work, Hirshhorn Museum, Washington, DC, 1988-2000, was restaged for the first time in 30 years on Tuesday and was meant to remain on display for three days to coincide with the opening of the exhibition Brand New: Art and Commodity in the 1980s (until 13 May). The projection was stopped immediately following the Florida shooting, but on Thursday the museum announced that it would be rescheduling it at a later date, to be confirmed shortly. Commentators on social media seemed to feel the same. When the Hirshhorn tweeted that it would no longer be projecting the work, a number of people disagreed with the decision. "With respect, the world needs this art installation now more than ever," said the local activist Todd Kimmelman. "Don’t you think this is the time the Members of Congress need to see that projection?" asked Guillermo Mena, a lawyer and policy leader at the National Hispanic Caucus of State Legislators. A spokeswoman for the Hirshhorn says that as soon as the decision was made to temporarily take down the projection, "it was always the hope of the museum to restage the work at another time during the run of the exhibition". But first it had to figure out logistics and consult with the artist. “To me, the silence feels most respectful,” Wodiczko added in a statement on Thursday. “In this case, not showing the projection shows respect and sensitivity to the people who suffer from this great tragedy.” Earlier video footage of the projection is now being shown in the museum’s lobby as part of the exhibition. This article was updated on 15 February to include the museum's announcement that the projection would be rescheduled.